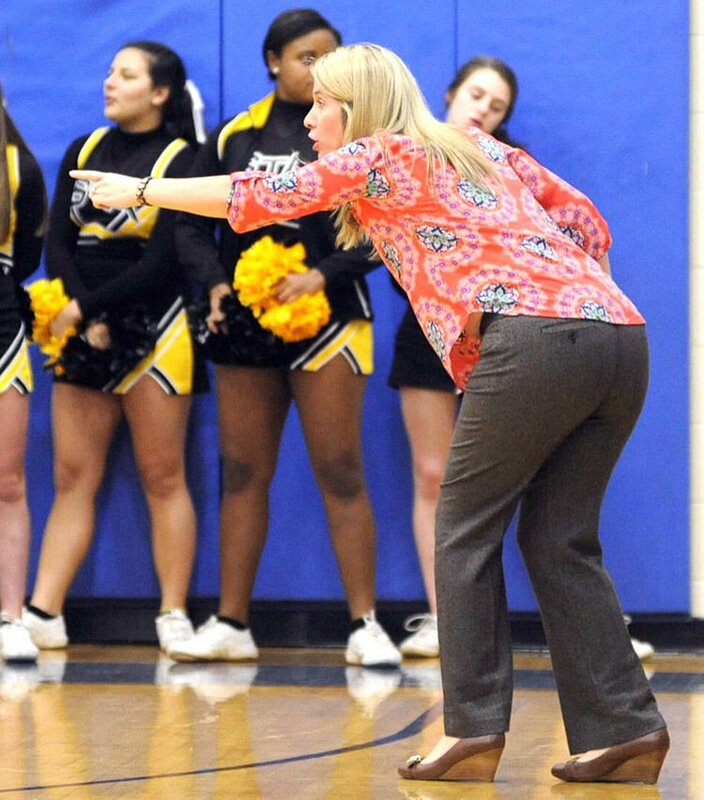 Kristy Englade is in her 10th year as head basketball coach for the St. Amant High School Lady Gators. Eric Simon and Troy Cole celebrate after a big shot during Ascension Catholic's home basketball game against St. John on Jan. 18. Jamar Barber maneuvers between defenders during Ascension Catholic's home basketball game against St. John on Jan. 18. He went on to score the game-deciding shot with three seconds remaining. Demontray Harry soars to the hoop during Ascension Catholic's home basketball game against St. John on Jan. 18. Matthew Foster executes on offense during Ascension Catholic's home basketball game against St. John on Jan. 18. Jamil Truxillo extends to the basket during Ascension Catholic's home basketball game against St. John on Jan. 18. The Bulldogs won 57-56. The good thing about young athletes playing early is that they gain experience and turn into veterans with leadership. The St. Amant High School Lady Gators are 19-5 with a senior-laden team that had to deal with adversity and inexperience two years ago. “This group took their lumps as sophomores, but they are seniors now, and we have won close games,” coach Kristy Englade said. The Lady Gators went 16-15 last season, losing to eventual 5A runner-up Natchitoches Central in the first round. Leading this year's team are Kelsi Martine and Mackenzie Brooks. “Martine averages 15 points per game and Brooks averages 12 points; they lead us in scoring,” Englade said. St. Amant is 2-1 in district (as of press time) with its lone loss to a very good McKinley team and a huge matchup with defending 5A champion and rival East Ascension. “We have a tough one against EA this week (Jan. 22); our district is a battle, night in and night out,” Englade said. The Lady Gators are ranked 20th in the 5A power rankings but have a chance to improve that with big games down the final stretch before the playoffs. “This group plays really hard; they enjoy being around each other, and they have set goals this season” Englade said. In her 10th year as the head coach of the Lady Gators, Englade has one thing in mind as the regular season comes to a close. “We hope to finish strong and advance further than last season, especially in the postseason “ she said. Kicker Alberto Ontiveros of East Ascension High School has earned an All-State honorable mention for Class 5A football play. Troy LeBoeuf covers sports for the Ascension Advocate. He can be reached at troyleboeuf@hotmail.com or ascension@theadvocate.com or on Twitter @Troyleboeuf.